A Mish Mash of Today. I would never have guessed that it was tilapia hiding under there yesterday! How da ya know I was looking for some new tilapia recipes? Love it because it looks beautiful with all those colors and because it sounds so good! How do you always know what I’m craving? This just looks delicious! This looks amazing! Making it soon. I love tilapia but I get bored so quickly of it because it’s always – bread it, fry it, eat it. This looks amazing. I’m pinning it on my new love – pinterest. Just came from Trader Joe’s and picked up fresh Tilapia, so I can make this yummy looking dish. As I type this, my fish is marinating, 30 more minutes to go and I get to eat it!! I can’t wait!! Wanted to make the salsa to go over top and I have all the ingredients but the avocado, so that will have to wait another time. Thank you for having so great dishes!!! We made this with chicken and your salsa and it was a party pleaser! We did grill it tho…but the lime marinade really shone through esp.with the salsa on top! I served it with ur marinated strawberry salad too with a honey balsamic dressing…needless to say we had an awesome delicious dinner so thank you!! Def a good go to when I wanna try something interesting and pretty! I made the tilapia with the blueberry lime salsa over the weekend for me and my boyfriend. We love to cook together and cook most nights. This recipe will be added to our rotation. It was DELICIOUS. I had some of the salsa left over because I made enough for 4 meals and we only made enough fish for the two of us but I plan on using the salsa over some Greek yogurt tomorrow morning for breakfast. I visit your site every day. I love it! I just stumbled across this recipe and the timing is perfect! Tilapia is on our menu for this evening and I was hoping to try a new recipe! Looks delish! Ha! I pinned this eariler then came to read my reader feeder lol… and low and behold look what I found! I can’t wait to try this out. looks so yummy! Made this for dinner tonight with the salsa – entire family LOVED it!!! Should have taken px, but they were gone too fast – thanks for another fabulous recipe! Made this last night! Amazing! I didn’t buy all the ingredient for the salsa so I just diced up an avocado, mixed it with lime juice, salt, and pepper, and it was all just very delish. My boyfriend loved it!! You’re a poet and didn’t even know it… ok, maybe you did. I woulda never thought to make tilapia like this. But it sounds freaking awesome! Plan on making this tonight for some yummy fish tacos….. Have you ever baked/broiled it, to cut down on the use of oil, my hubby hates frying things… .?? . I tried this tonight – AMAZING! I didn’t make the salsa, but I will try and do that next time. Even my extremely picky 3 year old ate all of his! Thanks for posting! Found this on pinterest and decided to try it for dinner. Unfortunately the store I visited had run out of the fresh tilapia they had on sale. 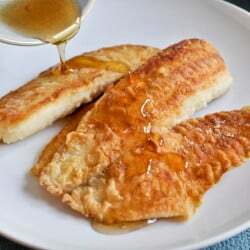 So I decided to try the recipe with orange roughy. It still turned out delicious. Made the salsa as well but I had put it in the fridge before dinner and didn’t like the cold salsa on my fish. But it was wonderful as a snack with tortilla chips. Great recipe, thanks! Made this last night with Speckled Trout (actually a type of Drum fish). Gulf Coasters will know what I’m talking about. It was AMAZING!!!!! Great Recipe! Thanks! This was amazing!! It didn’t get very crispy though, so not entirely sure what I did wrong but was still fantastic! Will definitely be adding this one to our rotation:). Thanks for a great recipe! Tried this recipe for the first time. My 20 year old blurted that it was the best fish dish so far . . . and I’ve made a lot of successful fish meals. I was under a 30 minute time pressure and it was easily achieved. I’ve printed it and will definitely make it again.